Creating demonstrable value is the single most important objective of a Customer Success organization. Renewals, upsells, references all happen when you have a relationship based on value with your customers. While achieving that objective requires input and contributions from Marketing, Sales, Professional Services, and other parts of the company, the Customer Success function owns the primary responsibility. Some companies do an incredible job at delivering and proving value to their customer base; however many companies (some would argue most) are working to put a model and plan together to demonstrate value for their customers. Getting them right, however, is by no means easy. Each one of them takes thought, analysis of data, and iteration. The metrics and behaviors you need to identify are going to be unique to your space – and if identified well, will actually be unique to your company, so that you can measure value based on true differentiators that you offer. So I offer these 5 steps not to make the process look easier than it is, but rather to provide some guidance as you take on your most important task as a company: continuing to earn your customers’ business. Every exercise needs an objective, and ideally a roadmap to get there. A framework provides your customers with a “bigger picture” view of the landscape and what they should be thinking about in order to be more effective at what they’re doing. Frameworks also give customers some perspective on where they fall with respect to industry leaders and laggards. 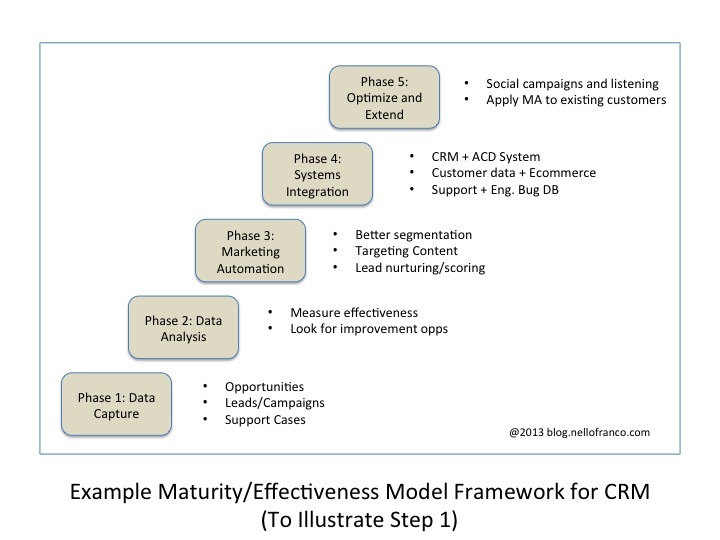 One framework that works well is a Maturity (or “Effectiveness”) Model. These models generally consist of 5 (plus or minus 2) categories that represent different levels of maturity/proficiency/effectiveness in your space. In order to define these categories (or levels of maturity), identify behaviors that are characteristic of each of those levels and associate those behaviors with each level of proficiency/maturity as shown in Figure 1 above. Customers can look at a framework like this and quickly conceptually grasp the types of behavior/activities necessary in order to advance along the model. As you develop this framework for your product and space, ideally try to map some of the behaviors that are associated with maturity levels to features of your product, so that you can easily associate customer usage of valuable features with their progress along the Maturity/Effectiveness Model. In order to objectively measure progress on an ongoing basis, you will need to identify relevant quantitative metrics that drive value, are measurable, and ideally are good indicators of customer health/stickiness. For example, in the case of a CRM company, you may want to know your customers’ conversion rate of leads or opportunities in order to understand whether you might be able to help them become more effective with your marketing automation solutions. In the next steps, you’ll compare this data to benchmark data for a given customer and measure improvement. You can also compare these metrics to aggregates for “like” companies. As you identify target metrics, you’ll need to distinguish which ones are considered “usage” metrics that you can obtain directly from your SaaS application and which ones will require consent and participation from your customers to obtain. It’s important to understand the specific stage where each of your customers fit in the model/framework you’ve created, and it’s also important to get some baseline data on quantitative metrics as well. For larger, higher-touch customers, you should be able to understand this during a consultative sales process; however even with lower touch customers, you should be able to characterize/segment new customers based on system configuration, features purchased/implemented, and initial capture of the quantitative metrics you identified in Step 2 for that customer segment. Create a structure and context for the ongoing digital and interpersonal communications you will have with your customers. Now that you’ve defined a framework, key metrics, and a plan for improvement against a baseline which you’ve captured, you can engage with your customers in a meaningful way that is focused around helping them get value from your product and become better at what they do. And you can measure their progress against defined objectives. As a first step, you may want your CSMs to interpret system data and personalize recommendations to individual, high-value customers. As you expand this offering to additional customers, you will need to define customer behavioral segments based on the metrics you’re capturing and provide those customer segments with extremely relevant digital content. For example, if you’ve identified a subset of your customers whose systems data indicate that they haven’t been using a key marketing automation feature of yours and that their conversion data hasn’t improved since their baseline, you can begin a drip marketing campaign to them on best practices in marketing automation and how to use your product to improve those metrics. That specific message should only go to that identified segment of customers, though, as you don’t want to “spam” your other customers with information that isn’t relevant to them. Your marketing team segments prospects based on behavioral data and delivers relevant content to them. You should target communications to your customers using similar logic. Great technology already exists to help you do this.